Aerosciences structural analysts are University engineering graduates with typically 25 - 30 years of experience working on primary and secondary aircraft structures and systems at major OEM`s. Our highly skilled industry veterans are able to efficiently perform rough or detailed sizing, optimize structural load paths, and determine the most cost-effective solution techniques for each structural design project. This capability includes metallic and composite structures, fatigue, damage tolerance, and dynamics analysis. 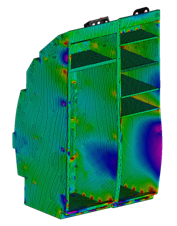 For larger jobs, non-linear analysis, composite structures, and accurate deflection predictions, Finite Element Models (FEM) are created using either Siemens UGS FEMAP or MSC Patran solver modules. These software packages can also solve implict and explicit non-linear problems. FEM`s are also utilized for structural dynamics analysis. For smaller jobs, and for Margin of Safety calculations for structural component details, classical hand analysis techniques are employed. Other software suites such as Excel and MathCAD are also used by our staff as needed to facilitate rapid structural substantiation.